Event Description: French chanson, jazz standard, tango & greek song with guidance from sensual lyrics and performed from violin, piano and vocals. French chanson, jazz standard, tango & greek song with guidance from sensual lyrics and performed from violin, piano and vocals. 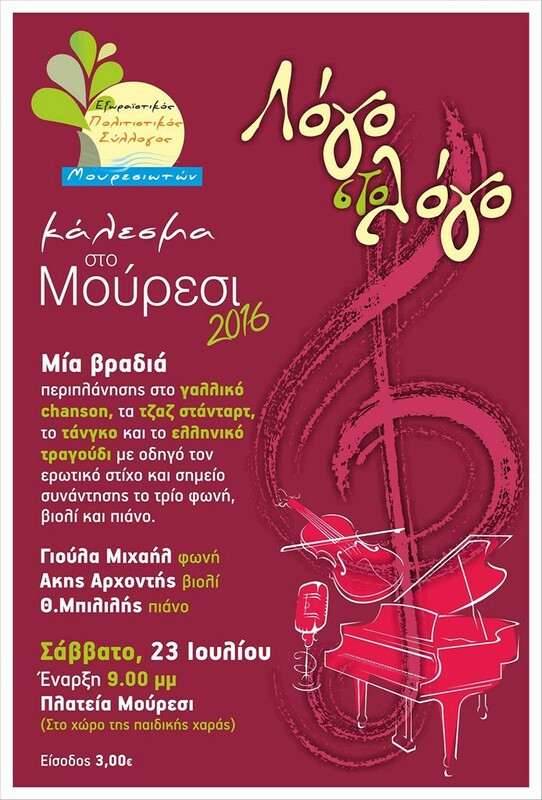 We are very happy to announce the programme of the International Pelion Festival 2016! Now in its 17th year, the PelionFestival will include courses in Zagora, as well as concerts around Εast Pelion, in Tsagarada and Kissos, that will be taking place from the 23th until the 31st of July 2016. As it happens for the third consecutive year, we are also holding our 3rd Violoncello Festival, which comprises courses, concerts and workshops that promote the collaboration and the exchange of ideas between professors and students. Additionally, all cellists will work together every day, as members of the PelionFestival Violoncello Ensemble, under the artistic direction of Prof. Ulrich Voss. With great pleasure, we will be hosting again Prof. Ulrich Voss, a distinguished music teacher from Germany, who will honour us with his presence for the 6th year running. The group of the violoncello tutors will also be complemented by Vasilis Saïtis from Thessaloniki, Angelos Liakakis from Athens, and Themistocles Vagenas from Volos, all of whom have been taking part and collaborating in the PelionFestival since 2014 . In addition, we welcome for the first time in Zagora the cellist Dimos Goudaroulis, who will give courses on classical as well as baroque violoncello, offering his personal view on the historically documented interpretation. Apollon Grammaticopoulos from Athens, who will conduct courses on the violin, will be with us for a third consecutive year, the same as soprano Sophia Kyanidou from Vienna, who will teach courses in voice and opera performance. An old friend of ours, the flutist Prof. Ana Domančić Krstulović from Split-Croatia will join, us with courses in flute. Finally, Zoe Samsarelou, artistic director of the festival, will be offering piano courses. A special participation in this year’s programme are the two saxophonists, Daniel Gauthier from Germany and George Ligeridis from Thessaloniki. The former will teach the saxophone while the latter will conduct the PelionFestival Sax Orchestra, which will be formed with the support of the Sax Nouveau Orchestra, thus offering to the audience of the festival an exceptional and highly original sound. In this year’s organisation we focus on the chamber music and the collaboration between professors and students playing different instruments. In this context, apart from the spontaneous, on the spot, formation of various ensembles, participants in one-to-one tutorials, before coming to the festival, will prepare chamber music pieces recommended by their tutors and performed during the concerts. As every year, PelionFestival will play a central role in the cultural life of Eastern Pelion, through daily performances and events that will take place indoors and outdoors, al fresco, in Zagora, Tsagarada and Kissos. International PelionFestival offers the opportunity to the participants and their families to visit a place of a unique beauty which combines green forests with beautiful and easily accessible beaches, thus being a good example of educational and cultural turism as well. Finally, we would like to express our graditude to all the businesses and professionals of the area who support us and show great sensitivity towards our culture and its development in the area. We wish to all the members of the festival, the participants and the professors as well as our audience an enjoyable and creative summer.